This cat is completely unconcerned that her curiosity incurred $400 in expenses. One night on vacation, shortly after turning out the lights, we were startled by a loud crash. Flipping the lights back on revealed that SOMEONE jumped up on the dresser and knocked the TV over. It fell onto the corner of the dresser and destroyed the screen's guts. Ugh. The next day, we ventured off to Walmart and bought a replacement. Two days after that, Hoss opened up his laptop and said with much astonishment "My laptop's broken!" The laptop, you see, was on the floor below the TV. The TV didn't want to die alone, I guess. Another $200 replacement (this time, just the screen; the laptop itself was fine). 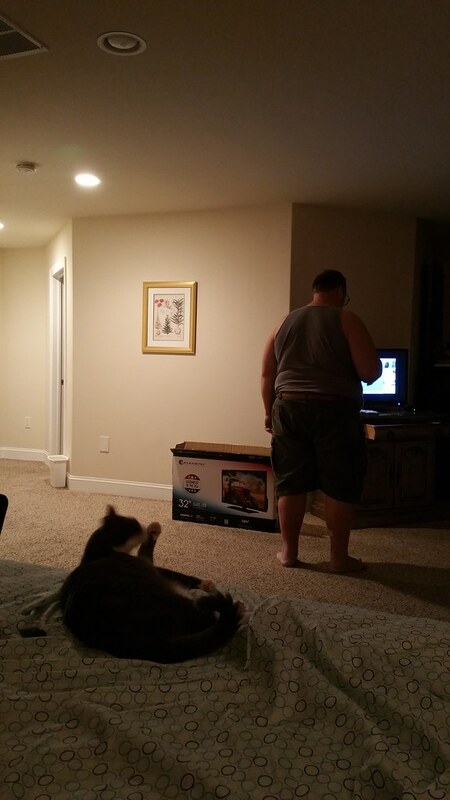 Here you can see Hoss adjust the new TV while the perpetrator takes a bath. Irony.